Back in the late 70s, when I first left home, I lived near a street that was famous for being chocablock with second hand shops. I spent many a Saturday morning rummaging through the treasures there, picking up amazing records from bands I never heard of, dilapidated furniture and bits and bobs to decorate my freezing hovel. Ahhh! Such memories. Amongst all the bric-a-brac was the occasional guitar. A green Microfrets was in the window of a shop that I never saw open. 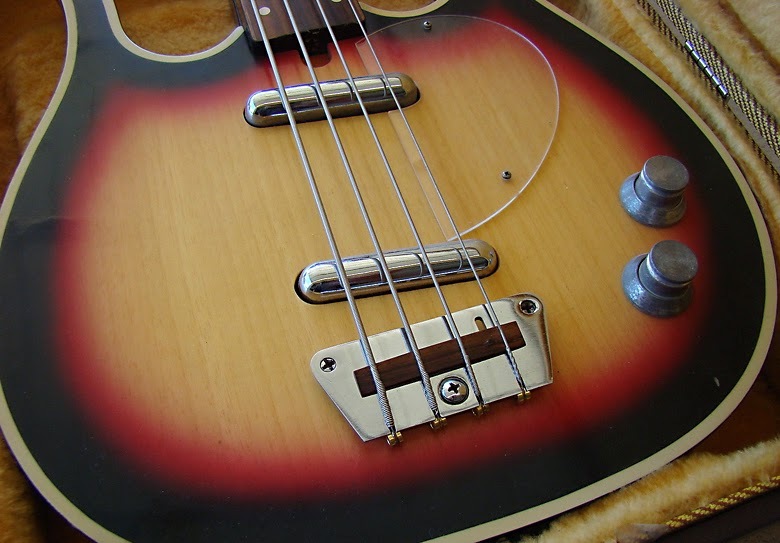 There were Silvertones galore, with and without amp-cases and ghastly Teiscos with nasty flower motifs on the scratch plate and strings like cheese wires. 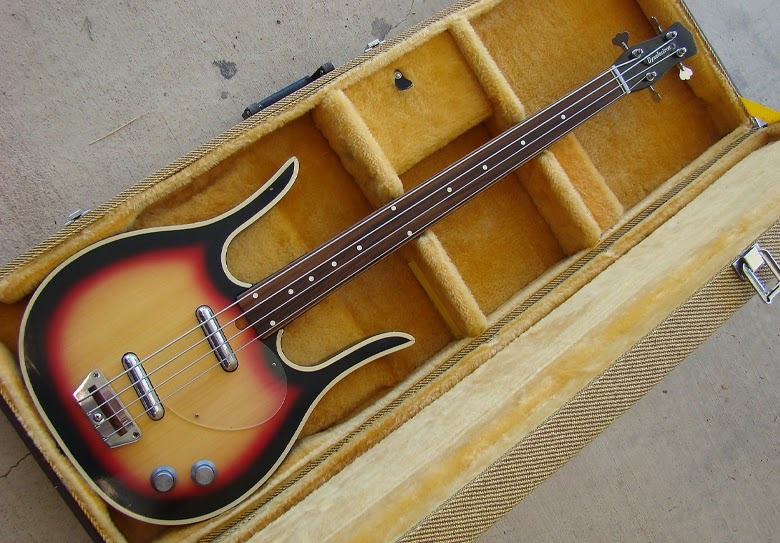 It was in one of those shops, I first saw one of these Dynelectro guitars. That got me a bit confused as I then thought they were the originals and Danelectro were copying them. It's hard to imagine now but, in 1965, a company copied another's product, even down to the almost-the-same name, and sold it openly. What is now known as "passing off" or back then "ripping off". I never did buy a guitar from that street but I did, eventually, buy a reissue, late '90s Dano U2 and it sounds and plays really well but I've never had the opportunity to play a Dynelectron. From what I've read about them Dynolectrons were at least as playable as the originals and this seller agrees. 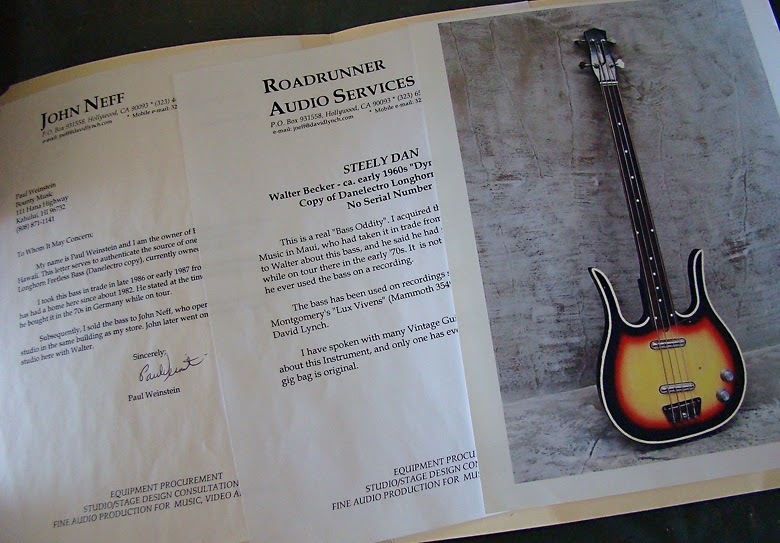 The pictures also seem to support that pretty well, as does the fact that it was once owned by Walter Becker. This is obviously a well made instrument and probably, given its provenance, is priced about right. But, it has a fairly specialised appeal, I'd say (although I wouldn't say no) and, as the seller has put it in a long-term listing, I don't think it'll be a quick sell. That means we can drool over it and imagine if we had the cash/space for even longer. That is a good bit of story telling. David In sunny but autumnal Barcelona should post more. Thanks very much. I just don't get as much time as I'd like but when I do, I want to be sure its' something interesting. I've been following some of the guitar groups on Facebook recently and came across quite a few guitars I've never heard of so I have new treasures to search for now. David in kind of clammy Barcelona. Called The Glitter Band. Used a Dyn Electron Bass. John Springate of The Glitter Band. Used a Dyn Electron Bass Guitar. Athough he used a Fender Bass. But it became his main Bass.